Grand Connaught Rooms has been abuzz for a couple of week now with two famed poker festivals namely the European Poker Tour (EPT) and the UK & Ireland Poker Tour (UKIPT). While the UKIPT Main Event has just reached its final table, the EPT London Main Event kicked off on Sunday. The festival began with the UKIPT Main Event poker tournament. Of the 1,089 players who registered on Day 1, only 8 made it through the final table. Brett Angell secures the chip lead with a nice stack of 5,190,000 chips. He now ranks well ahead of Nickolas Davies (4,000,000 chips), Rasmus Agerskov (3,150,000 chips), Vladimir Troyanovskiy (2,705,000 chips), Mark James (2,300,000 chips), Caicai Huang (1,960,000 chips), Fabrizio Fuchs (1,240,000 chips) and Sandro Mescola (1,145,000 chips). As for the European Poker Tour, 140 players paid the buy-in of £ 4,250 to take part in the Main Event-Day 1A flight. Only 56 players survived the day with Anatoly Filatov leading the chip counts. 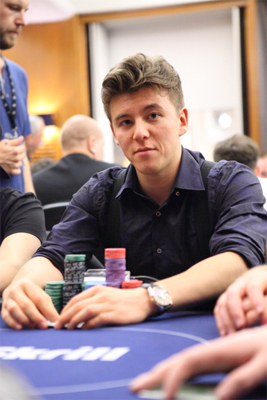 The Russia-based poker player will enter Day 2 battle with 173,900 chips, a chip advantage of nearly 30% over his nearest rivals: Johnny Lodden (125,800 chips) and Alexander Treallion (125,500 chips). Hossein Ensan Alfie Adam, Sergio Aido, Simon Taberham, Javed Abrahams, Joni Jouhkimainen and James Dempsey rounded out the chip counts Top 10 at the end of Day 1A. Notable players like Simon Deadman, Dominik Panka, Eugene Katchalov, Jason Mercier and Marvin Rettenmaier survived the day too. Those who prematurely hit the rail include November Niner Jorryt van Hoof, Sorel Mizzi, Martins Adeniyi, Bruno Fitoussi and Steve O'Dwyer.